We also have abundant raccoon, opossum and feral cats who would fight a cat for territory. In 2009, a case of rabies in a raccoon from Daniel Island was confirmed; proof that the virus is present here. View the SC DHEC annual rabies report here. Other diseases carried by wildlife which can affect our pets are heartworms, intestinal parasites and Leptospirosis. The best way to avoid exposure to these diseases is to keep cats indoors and keep dogs on a leash and out of wildlife habitat areas. For more on the "Indoor Pet Initiative", check out The Ohio State University College of Veterinary Medicine website. This question is also timely with the recent Post and Courier news story about a pet cat on Daniel Island being trapped and moved off the island because a neighbor found the cat to be a nuisance. Our neighbors may not be pet loving people, and it is in our pets’ best interest for us to prevent them coming into contact with people who do not appreciate their unselfish, loving companionship. If a neighbor’s cat is a nuisance, and you wish to keep them off your property, I recommend a motion-activated sprinkler by Contech called the ScareCrow. The sudden noise, movement and spray of water are humane ways of teaching animals of all types to avoid your landscaped areas. The first thing we do when someone brings in a found dog or cat is to scan the pet for a microchip while crossing our fingers that one has been placed. Microchips are an easy way to provide your pet with a permanent means of identification, even if the collar and tags are missing. Travel with pets and hurricane threats to our region are two compelling reasons to consider permanent identification for your pet. 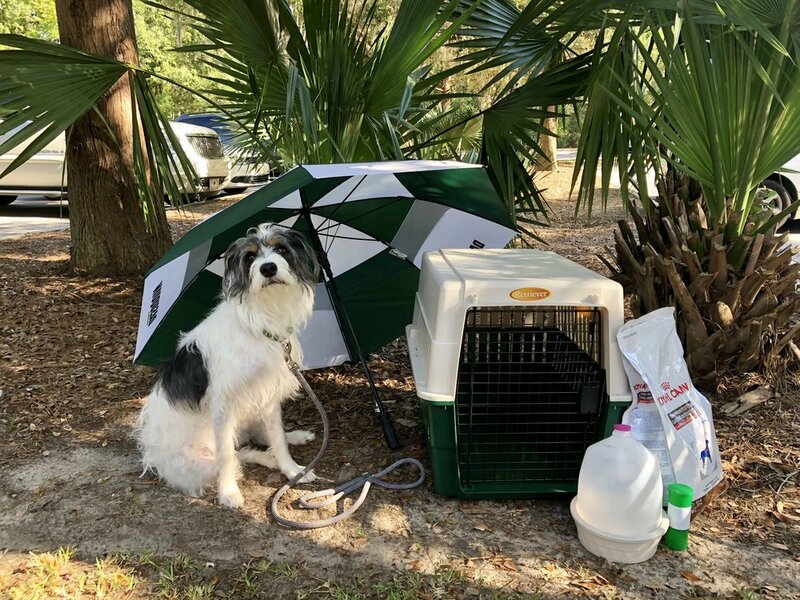 When evacuating for a Hurricane, remember to take two weeks of your pet's food and medications, plenty of fresh drinking water, towels, a harness and leash for dogs and a sturdy carrier for cats and small mammals. Keep a copy of your pet's medical history from your Pet Portal or ID card for proof of vaccines and plan ahead for a pet-friendly destination. Click here for more great disaster preparedness tips from the ASPCA. Microchip placement is a quick procedure, which can be done at an office visit to the vet. We encourage all dog and cat owners to take this precaution. After placement, we register the number in a national pet recovery database that is available 24 hours a day, 7 days a week, 365 days a year by telephone or on-line. We use and recommend HomeAgain microchips for their anti-migration technology. Other microchips are much less reliable. Even if an owner has not properly registered a microchip, the registry records where the chip was implanted, and by calling that facility, we can learn the owner’s identity. One of our patients wandered away while traveling in New Jersey, and a veterinary clinic there called us to get a mobile telephone number for the owner. The pet was returned home without ever involving animal control authorities. Our medical records are computerized, so we are sometimes able to narrow possibilities searching by breed, color and gender, and then telephone clients to ask if their pet is missing. We have been able to match pets and their families in this way, but it is much slower and does not work if the pet has not been to our hospital. Charleston is a wonderful location for pet owners, and dogs make great exercise companions for our trails and beaches, but now that we are in another Lowcountry summer, caution is indicated. Heat and humidity add to the workload for the heart, lungs, and cooling system of the body. Dogs do not sweat like humans, so their body temperatures rise more quickly with exertion. Panting and water consumption are their two most effective methods for keeping hyperthermia in check, and neither one is especially efficient. Dogs walked to our facility for appointments on cool, cloudy days often have body temperatures elevated as much as three degrees. Adding mid-day sunshine, high humidity, or a faster pace puts your pet at risk for serious health problems. The best time to exercise your pet is before 10:00 AM or after 6:00 PM. Just as you would condition yourself before tackling a six mile run, dogs need to start with shorter jaunts and build up to longer outings. Never force your pet to go farther than he wants, if he is stopping under every shade tree or lagging behind you, it is time to slow to a walk and head home to the air conditioning. If you think your pet is over-heating, wet the hair coat and allow your dog to drink fresh water and to rest in a cool place. Panting should begin to ease within a few minutes. Bright red gums and weakness are signs your pet needs help from a veterinarian. Body temperatures over 108 degrees Fahrenheit can quickly cause permanent damage to the brain, bowel, and other vital structures. Once that high, the body is unable to get it back under control without medical intervention. Not all dogs will let you know when they feel tired, so don’t depend on your canine companion to complain. Working breed dogs live to please their humans, and they’ll literally run, hunt, or retrieve themselves to death. Remember to exercise the responsibility that comes with pet ownership, as you exercise your buddy. He depends upon you. Are some breeds too dangerous for Daniel Island? A dog’s appearance or breed is NOT an indication of potential problems. Those assumptions are akin to racial profiling – not only unfair to pet owners, but also inadequate for purposes of reducing the risk of aggressive dog activity. Temperament testing individual dogs is a MUCH more effective way to determine which dogs are safe in a community setting and which dogs should not be allowed. Giving all dogs, regardless of their appearance, a temperament test enables identifying aggressive individuals of “safe” breeds (i.e. Labrador retriever) as well as determining which individuals of a “suspect” breed could be a problem. Breed assumptions are very inaccurate, more “wives’ tale” than fact. In actuality, most “pit bull” appearing dogs are sweet and safe. Certified trainers can administer the temperament test in about 10 minutes, and the results are far superior to using appearance alone to identify dangerous dogs. After over 20 years in veterinary medicine, I can personally attest to the fact that individual temperament is not determined solely by breed!! What is a temperament test? A good resource on temperament testing of dogs is the American Temperament Testing Society. By reading their website's breed statistics page, you will note that breed is not a reliable indicator for temperament. I am aware of several area trainers who are certified in AKC Good Citizen Testing and offer these tests locally. A smart and effective community policy is to require owners of dogs involved in any aggressive incident to have their dogs tested and certified before allowing them to stay. This policy protects everyone. When owners are required to present proof of temperament only after a problem arises, no one is targeted for their pet’s appearance, and the cost to the community is nothing. Dogs make great exercise companions for D.I. trails, but remember, your four-legged friend is wearing a fur coat! Some dogs won't slow when they get too hot or their pads are burning on the hot pavement; they live to please their humans, so they can literally walk, run, hunt, or retrieve themselves to death. Remember to exercise your responsibility as a pet owner. The best time to exercise your pet is before 10:00 AM or after 6:00 PM. Dogs need to start with shorter jaunts and build up to longer outings. Never force your pet to go farther than he wants; if he is stopping under every shade tree or lagging behind you, it is time to head home to the air conditioning. If you think your pet is over-heating, wet the hair coat and allow your dog to drink water and to rest in a cool place. Panting should begin to ease within a few minutes. Bright red gums and weakness are signs your pet needs help from a veterinarian. Cats, rabbits, ferrets and other small mammals should be kept indoors during the hours of 10 AM to 6 PM and should be outside only with supervision at any other time. Overall, some sort of restraint system is recommended for all pets who will be riding in the car. Restrained animals reduce your distraction from the task at hand and prevent your pet from roaming, jumping/hanging out the window, or being thrown from (or around) the car in the event of an accident. Using a crate or carrier is generally the best method of car restraint. These not only confine your pet, but they also provide some protection from flying objects. Crates should be secured to the seat or floor of your vehicle by looping a lap belt through the handle or using another tie-down method. Seatbelt harnesses are another viable option, especially for larger breed dogs. These are designed to be fitted to your dog’s chest and attached to the existing seatbelt in your car. To ease the introduction of a seatbelt harness for your pet, use treats and lots of praise. Start with short car rides, while your pet gets used to the new accessory. Be advised that the airbag should be turned off where your pet is placed. Follow product instructions for proper fit. Thanks for the topic suggestion! Happy travels!